You can have many altars around your home, or just one; it all depends on how comfortable you are with the idea of creating sacred spots/altars around your space. The truth is, if you have an area in your home that you mindfully decorated with images, candles and flowers, you might have already created an altar! 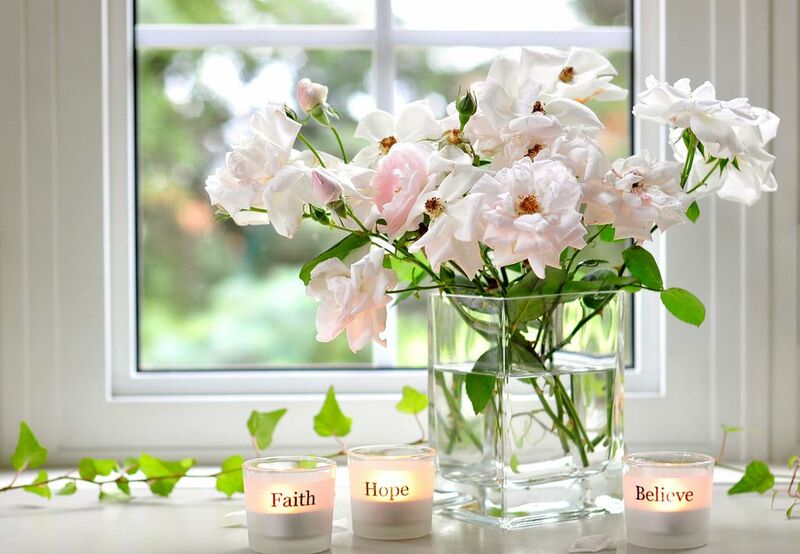 Let me share with you 10 simple steps to creating a good feng shui altar in your home. Having a very clear intent for any altar magnifies its power many times, so it is best to start an altar by having a clear intent as to its purpose and dedication. Is it an altar to attract and nourish the energy of love? For better health? For new career opportunities? Clarify your intent and this will lead you to the best items to use for your altar. Finding a good spot for your altar is very important for it to be able to maintain its energies. There can be so many options for the best location of your altar, all depending on your specific home, of course! A coffee table surface, your fireplace mantel, a shelf, a windowsill or even a big plant pot - they all can be a great foundation for a beautiful altar! This is not a rigid rule as you do not have to have all 5 feng shui elements on your altar if the idea feels too complex for you. Usually, you will have at least 2 or 3 items to represent the elements - candles for Fire, flowers for Wood and crystals for Earth and this is good, too! However, know that you can bring the other two elements in a very subtle and powerful way. A metal incense holder brings the Metal element and a small mirror brings the Water element and voila! - now you have them all. For example, an altar for better health will benefit from many natural, fresh items, so you might choose a bouquet of flowers or a vibrant plant as a focal point. An altar for more ease and compassion can much benefit from a Kuan Yin statue. For more money and better luck look into a Laughing Buddha or the Ganesha sculpture. And an altar to unleash your wild feminine powers can be ignited with a fiery statue of a beautiful dancing Goddess! Candles are a must-have for almost all altars. They bring the purification energy of the fire feng shui element, surround the space with glow and warmth, as well as constantly elevate the energy of your altar. Pay attention to the size, shape and color of your candles as relating to your intent. For example, green and blue candles can be ideal for an altar dedicated to health and family's well-being, while the red and orange ones are obviously excellent for a passionate love altar! White color will be better for career success, while purple goes well with an altar focused on deeper connection with the spiritual worlds. Of course, you can always use tea light candles and just bring colors and shapes with specific candleholders. Good quality incense is another must have for a good feng shui home altar. I mention "good quality" because there are many inferior quality (or highly perfumed) incense varieties that can just give you headache. Experiment with different brands and see which ones you and your house love the most. I love the Nag Champa incense and use it most of the time, but from time to time I experiment with other ones, too. Nag Champa is my to-go incense as I have used it for years and love it still. A good feng shui altar will have fresh and vibrant energy to it, so it goes without saying that if you bring fresh flowers or a vibrant plant, your altar will much benefit from it! Choose the vase or the pot with intent, too, by paying attention to colors and shapes. Everything around us carries a specific quality of energy, so be sure you choose only what strengthens your intent. Natural crystals and rocks are another must-have for a good feng shui altar in your home. Luckily, you can buy crystals in so many places, which makes it very easy to embellish your altar with their exquisite energy! You can choose specific shapes, such as hearts, stars or angels. You can also most definitely bring specific crystals that carry the energy related to your intent such as rose quartz for love, tigers eye for protection or hematite for career success. When you have checked the "must have" list for your altar, be sure to personalize it with items that are very deeply connected to your intent. This can be absolutely anything that feels good and right to you - from an old movie ticket that holds a special meaning to pictures of adorable babies if you are trying to conceive. No strict feng shui rules here - only the rules of your own heart! After you've collected all the items, play and see what feels best to you. "Play" is the keyword here, as you will have to find out energetically how what your altar wants to be set up. Usually, you will start with a focal point related to your intent and then position the items around it in the manner that feels most harmonious. Creating a powerful altar is a very intimate process. So, after you've read these feng shui steps, trust your inner guidance and your playful spirit. In conclusion, let me say that it is definitely good feng shui to change the items on your altar often so that to keep its energy fresh and flowing. Reposition the crystals, flowers, bring more colors, candles or deities - express your creative energy as this will only help manifest your intent sooner. Good luck with creating an awesome altar for your beautiful home!